YOU MOVE ME moving company franchise was founded by Brian Scudamore, CEO of 1-800-GOT-JUNK and WOW 1 DAY PAINTING. UnhappyFranchisee.Com asks: After its big initial launch, is Scudamore’s company resorting to illegal earnings claims and financial misrepresentations to sell franchises? Is franchisee poster boy Andrew Wilson’s $1M first year a fraudulent misrepresentation? (UnhappyFranchisee.Com) Brian Scudamore pre-sold franchises in 25 cities to 1-800-Got-Junk franchisees before launching his You Move Me local moving concept in 2013. That quick launch enabled the You Move Me franchisor to reportedly generate $5.8 million in system-wide revenue in just its first year. You Move Me is trying to sell the 2nd wave of franchises with an aggressive public relations and online media push which highlights initial franchisee success stories, such as the powerful story of an Oklahoma franchisee named Andrew Wilson. Andrew Wilson, who was deployed in Iraq & Afghanistan, allegedly combined his military training and discipline with the innovative You Move Me franchise system to complete nearly 3,000 moves and generate $1.3 million in sales his first year in business. Andrew claims he is on track to hit $2 million in 2015. 2) Are the representations being made by and about Andrew Wilson’s first year true? We are asking Andrew Wilson, Brian Scudamore, The You Move Me franchise team and those familiar with You Move Me to please share your thoughts with a comment below or by emailing us at UnhappyFranchisee[at]Gmail.com. Is You Move Me Making Illegal Financial Performance Representations? We do not make any representations about a franchisee’s future financial performance or the past financial performance of company-owned or franchised outlets. We also do not authorize our employees or representatives to make any such representations either orally or in writing. Note that franchisors that make no Item 19 financial performance representations are prohibited from making any such representations outside of the confines of the disclosure document. This prohibition encompasses any financial performance representations made in any advertisement or on a website directed at prospective franchisees. The making of any such contradictory representations is itself an independent violation of the amended Rule. The You Move Me PR team must have really been working hard because the questionable earnings claim is published on franchise sales and military sites across the Internet. Is Andrew Wilson’s Story Misleading? I researched independent moving companies and compared their performance to other moving franchises in North America. I started to see that the fastest, most efficient way to build a business in this industry was to join a franchise system that had the infrastructure in place to support me. However, an earlier news story in the Broken Arrow Ledger, written by Sarah McCallion and entitled “BA Moving Company Goes National” states that Andrew Wilson already had owned and operated an independent moving company called Easy Moves Co. When the founder of 1-800-GOT-JUNK? Brian Scudamore decided to start a moving franchise, I jumped at the chance to get in on the ground-floor. I believed in his vision to bring professionalism and exceptional customer service to an industry that has been lacking both. I loved the fact that You Move Me set out to make the painful experience of moving almost fun. When Andrew Wilson, Josh Herron and Tyler Staszak – Easy Moves Co. co-founders – decided to expand, they consulted the founder and CEO of the 1-800-GOT-JUNK?, Brian Scudamore. Scudamore was so impressed by Easy Moves Co., he chose to franchise the company. In 2013, we did close to $1 million in revenue between our locations in Tulsa and Oklahoma City which was a pretty impressive feat given it was our first year. In 2014 we are hoping to surpass $1 million and will then look at possibly expanding to a third location. However, the BA Ledger article states that 2013 wasn’t Wilson’s first year in business and he did not start from scratch with You Move Me. “You Move Me,” currently Easy Moves Co. on 1115 S. Aspen St., will expand this year throughout North America. Easy Moves began with locations in Broken Arrow, Oklahoma City and Kansas City, Kan. In their first year, the two Oklahoma locations recorded combined revenues of $450,000 and completed 1,500 jobs. …Easy Moves was a highly successful, and fast growing business, and for two years and over 3,000 moves we provided exceptional moving services to Kansas City, and the surrounding areas. 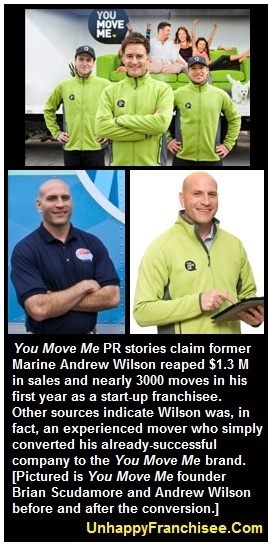 In both the Entrepreneur interview and the Franchise Business Review “Special Report,” Andrew Wilson is quoted as saying he did 3,000 moves and $1.3M his first year as a start-up You Move Me franchisee. Yet the BA Ledger story and Josh Herron’s bio seem to indicate that Wilson was already an experienced moving company owner whose company was doing thousands of moves before converting it to the YMM franchise. Is this why You Move Me has decided not to disclose Mr. Wilson’s amazing first year in its FDD? Because it’s not true? Are Andrew Wilson, Brian Scudamore & You Move Me LYING to Military Veterans & Prospective Franchisees? Franchise Business Review and Entrepreneur provide paid advertising opportunities to franchisors who want to recruit prospective franchise investors. The You Move Me public relations team seems to have promoted Andrew Wilson’s story there and across the Internet to entice trusting franchise prospects with the proposition that they, too, could achieve those results as first-time franchisees with no prior experience. Andrew Wilson seems to have no problem with You Move Me using him to recruit fellow military veterans with this amazing but questionable claim. Perhaps there are perfectly valid and defensible explanations for why You Move Me is promoting a success story that appears to include illegal earnings claims and some major inconsistencies. Or maybe Wilson, Scudamore and the PR team cooked up this whopper of a success story in order to sell franchises under false pretenses. If the latter is true – and we hope it’s not – it’s a pretty sad situation and this is a group of individuals franchise buyers would do well to avoid. ARE YOU FAMILIAR WITH THE YOU MOVE ME FRANCHISE, ANDREW WILSON OR BRIAN SCUDAMORE? SHARE A COMMENT BELOW. ← FBR Franchise Business Review Promoting Illegal Earnings Claims? Scudamore contacted me through LinkedIn-because of my large social media reach, about a year and a half ago asking if i would share information on his “new” franchise. Since i knew of him, I told him that I knew of his success with Got Junk, and I’d be happy to help him promote his new venture. I offered to add his franchise listing on my franchise directory and to write a couple of articles…for a marketing campaign. For a price. My first thought: What a cheapskate. A millionaire cheapskate-the worst kind. So, Brian basically wanted to USE me and my social reach to help him sell franchises. For free. About his new concept: Whatever. If he is in fact making illegal earnings claims…he needs to cease and desist from doing so. And, penalized for it. His lawyers will be getting busy soon, me thinks. Seems that Brian Scudamore and You Move Me should self-report to the FTC and states these violations and offer rescission to all the franchisees that relied on this illegal earnings claims. It’s the only way to fix this and avoid the $11,000 FTC fines per violation occurrence which could add up to a lot of money. Tyler Staszak and Josh Herron, named as Easy Moves cofounders in the article, are 1-800-GOT-JUNK? franchisee and general manager, respectively, for the Kansas City franchise. Who’s on whose payroll in this scheme? Brian Scudamore has a staff of people spreading his You Move Me message across the internet so unless all those people work for free he is paying for publicity. Now he may really have to pay for it in FTC fines at $11,000 for each instance. And the FTC can reach him in Canada. It’s interesting that the Item 19 language says to notify appropriate state agencies of any unauthorized earnings claims being provided. I wonder if state agencies ever act on earnings claim violations. Anyone know? I also wondered what Andrew Wilson is getting for his success story. I assume he owns a chunk of the franchisor, since it was his moving company they franchised. Anyone know? California will look at this and likely require Brian Scudamore to offer rescission to franchise owners in their state. If there are no franchisees in California they can take other actions. Will Andrew Wilson come and comment? We have contacted Mr. Wilson, Mr. Scudamore and the You Move Me PR team. Their PR director said their attorney was reviewing the situation. Mr. Wilson, Mr. Scudamore and the You Move Me PR team are hoping this problem just goes away. Turns out a surprising number of people from the FTC and state franchise regulatory agencies are regular readers here. UF has an annoying habit of not letting things like this simply go away… especially when our requests to the company for comment or clarification are continuously ignored. We consider it bad form. One of the big problems with illegal earnings claims or FPRs is that prospective franchisees want them. They are scared of investing and they want confidence that they are making a good franchise investment. Franchisors and franchise brokers are well aware of this and take advantage of the prospective franchisee’s need to know an estimate or range of what they could make. And franchisors know that prospective franchisees will not report them for the compliance violation. Yes You Move Me. Just not they way you thought. Mr. Wilson and Mr. Scudamore when do you plan to respond? California could make You Move Me to offer rescission to franchisees. Mr. Wilson, Mr. Scudamore and Mr. Stites what say you about this? What do Mr. Wilson, Mr. Scudamore and Mr. Stites have to say? This sounds like a witch hunt. I don’t see a single franchisee complaining. Isn’t this site named “unhappyfranchisee”. Yes I am a franchise broker and I use this site to look for gotchas with franchises I might promote. Why WOULD You Move Me respond? Impugn me if you may, but it is the way it looks to me. You Move Me DID respond… just not directly to us. You Move Me responded to the state investigation that resulted from the complaint that we filed. You Move Me admitted that their sales and marketing people acted improperly and that they were taking steps to keep it from happening in the future. So we got the warning out BEFORE more prospective franchisees were hoodwinked into believing the bogus success story and illegal earnings claim this company publicized. I think that is a good thing, don’t you, Ken? Now let me ask you: A franchisor puts out a false story about a military vet who stumbles upon this moving franchise, applies his skills learned in the service, and makes millions in his first couple of years following this franchise systems instructions. The story is told to our returning military veterans with illegal earnings claims (violation of FTC regulations) embedded in the story to entice them to stake their family’s financial futures on an investment decision based on this success story. Our savvy, unpaid investigation reveals that (in our educated opinion) it’s a blatant deception… the guy was actually an experienced mover and the business was in its 3rd year of development – not a frwesh, 1st year franchise by a newbie. In fact, the You Move Me concept was based on this guy’s business experience. Our takeaway is that this is a company willing to lie to US military veterans for $$$. The franchise broker’s takeaway is that it’s unfair for us to expose this fraud until there are enough military veterans and other franchise seekers unhappy enough that one will complain. This, my friends, is why franchise seekers should be VERY VERY CAUTIOUS & VERY VERY SKEPTICAL of franchise brokers like Ken. There are few outrageous and illegal practices that some people can’t justify in order to extract their sales commission. We encounter many instances where brokers and salespeople have no problem selling franchisees into a $500K loss, BK, foreclosure, etc. for a $10K commission… and still sleep at night and go to church on Sunday. Brian Scudamore has taken to writing his own articles in Forbes complete with a massive earnings claim and false statistics. From Brian Scudamore’s Forbes article February 21, 2017. And now his salespeople are spreading it across social media outlets. One humorous thing… he cites a bogus survival statistic and they link his words to a Forbes article debunking the bogus statistic. I remember way back when when Forbes was actually a credible source of business news. Here are the Franchise Sales personnel who sell the 1-800-Got-Junk family of franchises using the Forbes article with the massive earnings claim and false statistics. Brian Scudamore is violating the FTC rules again by putting up phony job listings on LinkedIn, Indeed & other job sites. There are a lot of these misleading Scudamore LinkedIn Jobs.